All the information about roulette betting strategy, how to make winning bets according to Pivot, Fibonacci, Oskar's Grind and Double Street systems. Although roulette is considered to be a gambling game of luck, but it is still highly important for roulette players to be aware of roulette rules and various roulette betting systems, which could provide rather useful tips how to make appropriate bets. 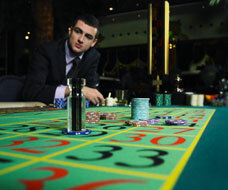 There exists a number of roulette betting strategies and tactics, which are widely exploited by experienced gamblers and which are strongly recommended to learn for roulette novices in order to understand the sense of roulette play better. In this section we would look through the most popular and proved of them, so you would at least have an idea about how to make roulette bets properly. Pivot system is based on the implication that despite the fact that roulette wheel is equipped with 36 numbered pockets (for simplicity we ignore zero positions, which are different in diverse roulette variations), only 24 of them are hit for 36 spins, which by-turn means that 12 of the pockets are so-called 'cold' positions, which are unlikely to be the winning ones. The abovementioned implication also leads to the fact that some of 'hot' 24 roulette slots should be hit repeatedly (twofold, threefold, etc.) during 36 spins. Therefore, the obvious advice here is to observe different roulette tables and try to define 'hot' numbers in order to make further bets, which would include them. Fibonacci system is grounded on special series of numbers, which is called Fibonacci sequence and was developed by famous mathematician Leonardo Pisan from Pisa, Italy. The row of numbers is the following: 1, 1, 2, 3, 5, 8, 13, 21, 34, 55, 89, 144, etc., which is derived so that each next number is just a sum of two previous numbers. Gamblers apply Fibonacci system in roulette by making the first bet of 1 unit and in case they lose they need to move along the Fibonacci sequence and writing down their own sequence of losses. If players win the first bet or any other bet they are to strikethrough the last two numbers in a series of losses and make the next bet of a size that equals to their net profit/loss of units. Eventually, when all the numbers in a row of losses are crossed out, it is considered that Fibonacci system is over and gamblers need to start betting from the very beginning. There are two other popular and widely practiced roulette betting strategies that are namely Oskar's Grind and Double Street systems, which are rather useful and therefore, they are also worth your attention.